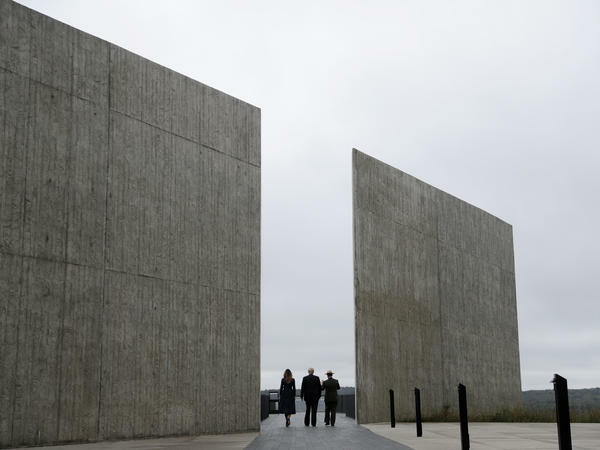 President Trump, first lady Melania Trump and Stephen Clark, the superintendent of the National Parks of Western Pennsylvania, walk through the Flight 93 National Memorial in Shanksville, Pa., on Tuesday. He said the field where United Airlines Flight 93 crashed, after passengers overpowered the hijackers who had commandeered it, "is now a monument to American defiance" and "a message to the world America will never ever submit to tyranny." Nearly 3,000 people died when hijackers flew jet planes into the World Trade Center in New York and the Pentagon in Northern Virginia. Flight 93 was believed to be heading for the U.S. Capitol when it went down in Shanksville. Trump noted that nearly 7,000 service members have died since Sept. 11 and — using terminology avoided by his predecessors — said they were "facing down the menace of radical Islamic terrorism." At the Pentagon, where 184 people died when American Airlines Flight 77 struck the building, Vice President Pence said, "A growing number of Americans have no living memory of what happened here." Pence noted that "roughly one-quarter" of Americans were born after Sept. 11, 2001. "We gather here," Pence said, "to ensure each succeeding generation knows the story of what happened that dark day, and understands why we must learn the lessons of 9/11 and remain ever vigilant in the defense of our nation and our people." In New York City, at the National September 11 Memorial & Museum, relatives of those killed in the collapse of the twin towers continued the tradition of reading the names of the victims as church bells tolled on the moments the planes struck. Vanessa Lang Langer and her unborn child were among those who died that day. Her name was read by her brother-in-law, Thomas Langer, who also honored the husband she left behind. "I witnessed my brother endure the pain that no one human being was ever meant to bear," Langer said. "Eventually Timmy Langer drank himself to death." Seventeen years after Sept. 11, Langer says, the tragedy "continues to affect every family and friend differently."